Myths of Medical Malpractice Lawsuits in Michigan. Buchanan & Buchanan. In 2006, Harvard School of Public Health released a study amidst the ongoing debates over medical malpractice lawsuits in America and their legitimacy. The authors of the study reviewed 1,452 closed claims from malpractice insurance companies and found that most injuries were due to error, casting doubt that the system is plagued by frivolous lawsuits. The reality is that insurance rate increases are much more correlated to the insurance industry’s economic cycle, not to medical malpractice claims. What about the rising cost of healthcare? Healthcare costs keep rising, however, malpractice claims have decreased dramatically in the past decade. It is illogical to correlate the rising cost of healthcare with medical malpractice claims. A study from the RAND Institute published in the New England Journal of Medicine in 2014 found no effect on emergency department care in light of malpractice reform. The study found legislation that substantially changed the malpractice standard had little effect on the intensity of practice (i.e., there was no increased orders of medical tests or longer hospital admissions) – thus, there was no reduction in patient costs. The truth is most medical malpractice attorneys carefully evaluate claims to ensure they are meritorious. Statistics prove that medical malpractice attorneys reject approximately 80 percent of requests for representation. While some may be viable claims, Michigan law prohibits attorneys from bringing claims unless three clear elements are reached: a breach in the standard of care, the breach caused a damage, and the damage resulting from the breach in the standard of care is significant. Often, the damage because of the breach in the standard of care is insignificant, making the claim difficult to pursue. Plaintiffs’ medical malpractice attorneys are patient advocates. They are real people who want to help others. While it is a business, most medical malpractice firms have core values of helping others first and foremost. At Buchanan & Buchanan our core value is securing prompt and just compensation for the wrongly injured. We want to help others who have been wronged. Most medical malpractice claims are not catastrophic claims. Payouts over $1 million often are claims involved a baby injured at birth needing lifelong care, or serious injuries resulting in brain damage or quadriplegia. Between 2003 and 2008 the money recovered in medical malpractice lawsuits has dropped by 50 percent. In Michigan, non-economic damages (i.e., damages for pain and suffering because of medical negligence) are capped. The caps limit the money a victim of medical malpractice can recover for pain and suffering. The current maximum for all plaintiffs, resulting from the negligence of all defendants, is set at $445,500, except in instances of paralysis due to brain or spinal cord injury, impairment of cognitive capacity, or loss of reproductive ability, in which case the limit is $795,500. Any jury award in excess of these amounts must be reduced by the court. Most individuals file medical malpractice claims to find answers after a bad outcome and not receiving straightforward answers from healthcare professionals. 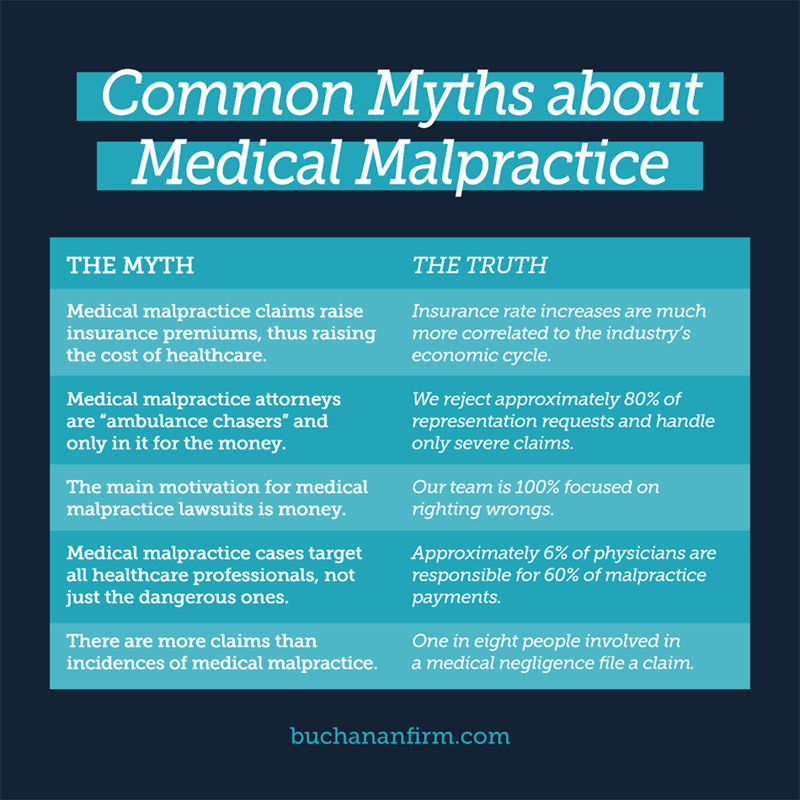 A common misconception is medical malpractice lawsuits target the vast majority of health care professionals, and do not target the minority of dangerous health care providers. In reality, from 1991 to 2005, approximately 6 percent of physicians were responsible for 60 percent of malpractice payments. Of the 6 percent, each doctor was found liable of medical negligence twice, and 2.3 percent found liable 3 times, and 1.1 percent liable four times. The statistic proves the medical malpractice lawsuits hold dangerous health care providers responsible for their actions and are successfully targeting those who continue to provide negligent care. One in eight people involved in medical negligence file a malpractice claim. The media suggests medical errors are rare occurrences. In reality, medical errors are common. The Journal of Patient Safety in 2013 revealed medial errors are the third-leading cause of death in America, trailing only heart disease and cancer. Between 210,000 and 440,000 hospital patients each year suffer a preventable harm in hospitals that contribute to death. Most Americans are unaware medical errors occur frequently in hospitals and clinics. Despite the massive number of medical injuries, medical malpractice lawsuits are uncommon. In reality, they constitute only three percent of the civil tort caseload. At Buchanan & Buchanan, our combined legal-medical team has decades of experience handling medical malpractice cases. We also have medical professionals on staff to talk with you and review your claim. We quickly and efficiently assess the medical facts and take immediate action to protect your rights. We are patients’ advocates, and will successfully convince you legal action for medical negligence is fair and just, contrary to common misguided “frivolous” misconceptions.